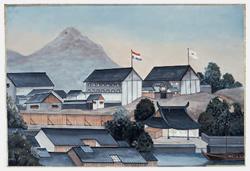 Pompe established Yōjōsho, the first modern western–style hospital and medical school in Japan. On August 6, 1861 (July 1, the first year of Bunkyu Period) the ceremony to celebrate the completion of the building was held. On September 20, 1861 (August 16, the first year of Bunkyu Period) the opening ceremony of the hospital and the school were held.